We definitely knew something was wrong. Our beloved coffee pot was failing. It would stop right in the middle of the brewing process gasping for breath in need of rest. And then one day, it just wouldn’t turn on. For us. Or the coffee maker. I didn’t always drink coffee. Not until I had this little baby who got up at 5:30 in the morning and I used to plop her in the Baby Bjorn and pace the empty streets of the West Village until 7 am when the coffee shop opened. And then it was my husband Rick who showed me that you could actually make coffee at home. In fact, he thinks it’s so good he willingly and enthusiastically drinks 5 day old coffee from the pot. I know. He’s fancy like that. Obviously he has a problem. What do you want me to do? They don’t have self help groups for every issue out there. So anyway, our coffee pot is done. And we’ve been feeling a lot of Keurig pressure. You know, these single cup coffee makers. My mother-in-law generously bought us one but we had to return it. Because it starts with individual coffee containers and pretty soon Rick and I are living separate lives. Plus, as much as I would like a cup of Green Mountain Island Coconut coffee some mornings, the Keurig thing seems complicated. All those cups and it’s sort of luke warm and I don’t know, I’m just not ready to go edgy like that. I am still using a paper daily calendar for gosh sakes. Don’t make fun of me or I’ll mock you when you lose your phone and you have no idea when you scheduled your lip wax appointment. 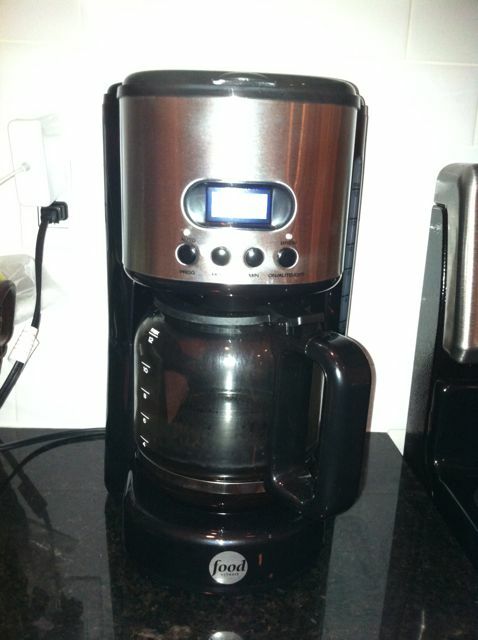 Anyway, here’s the new addition to our family… our coffee pot. I know it’s not a baby or a kitten but feel free to ooh and ahh anyway. Dunkin Donuts coffee?! OMG. Now Starbucks is coffee worth leaving your kids in the car for! leaving your kids in the car AND going to jail for. But then so is crystal meth and so what does that make me? I find those Keurig machines an instrument of the devil. I’ll stick to drive thru! You know that the K cups come in Starbux and Dunkin Donut flavors and the like don’t you? We’ve crossed over and I was feeling great about it until someone mentioned to me about how wasteful it is to have all that packaging for one cup. So now every time I brew up my one cup, I don’t enjoy it as much because I’m destroying the planet. or get one of the re-usable k-cups and fill with your own grounds. whew! back to guilt-free coffee! My husband swears that Dunkin’ Dark is far better than any Starbucks, Marinka. I wouldn’t know, myself, because I don’t drink the stuff. I’m the only coffee drinker in our house, so the single serve works. The Kahlua flavor – so yummy. I purchased a Keurig last year when butterfingers (aka: Me) dropped and busted the umpteenth Mr. Coffee glass pot in the sink. We have drive-thru Starbucks and Dunkin Donuts here. To compensate, we have to leave our kids in the car when we dash into Walmart. Awwww…I want to pinch it’s little stainless cheeks! Also, I think you can take a stand against the Keurig on environmental grounds; every single cup creats something new for the land fill! I got married that I love so I hope it keeps kicking. I too use a paper/pencil calendar and am slowly, ever so slowly, beginning to use my phone for organization, but I always refer to the paper version before committing to anything because it’s more reliable. 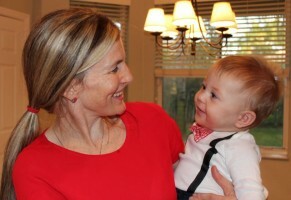 I’ll ooh and aah over a coffee pot any day – it’s the bearer of the magical “make mommy do things” potion. I’m totally with you on DD coffee. WAY better (and cheaper) than Starbucks regular coffee in my opinion. Now, when it comes to fancy drinks, though, Sbucks still has my heart. P.S. – I don’t know about Rick and the 5 day coffee. Doesn’t it go stale? Is that just me? I can’t control my rant on the Keurig. It just comes busrting forth every time I here the word. Ugh. The waste. All those stupid little plastic containers. Love your new pot Kelsey! Thank you for not getting a Keurig. Such waste! never heard of this new-fangled keurig thing, but i’m anti-packaging, so it doesn’t sound good. and, er…I might be with Rick on this: I drink iced coffee. year round. It started when i was pregnant w/baby #1 because somehow decaf was more of a perk-me-up when it was served cold…and then I just never went back. So the coffee left in the pot (husband likes hot coffee, go figure) gets dumped into a container & into the fridge for me. which means yes, four or five day old coffee is what i’m slurping down every morning. I’m glad you got rid of the single serve thing. Those packets are bad for the earth! And you are right, they don’t taste that good anyway. Funny about making coffee, I can cook almost anything but I cannot brew my own coffee! Luckily my hubby, who can barely boil water, can make one heck of a cuppa! Yah Meg..best coffee making is a different art. Need expert hand if you want a perfect cup. And when the taste is bitter, feeling the whole day spoils. Fresh roasted coffee bean, Good coffee grind and at last perfect brew I always love! I feel like smelling my coffee just this moment..!! Keurig is not good for Rick then because it will be always fresh and not 5 days old as he likes it. I don’t drink coffee but I really love the smell of a fresh brewed pot every morning. I just stopped using my paper daily calendar a few weeks ago, so I’m feeling your vibe. But now I’m terrified that I’m going to miss my de-mustache appointment. We have a tiny kitchen with miniscule counter space so we actually tossed our coffee maker when we moved here. We use a coffee press now. But we don’t actually make coffee every day. Chris drinks all of his at work and I prefer to poison myself with aspartame via Diet Coke. I was wondering if I was the only French Press fan in the bunch. It’s really where it’s at. Great coffee. Divine. I just love your blog! Love it! Keep ’em coming! You know, I would have one of those if they stayed hot. The one I had was also like luke warm blagh and just didn’t work. My son has his heart set on the one that the sunlight touches and it brews… God bless him! I know exactly how it feels as a coffee lover when coffee maker breaks down so early in the morning. You can actually make really great coffee without an automatic coffee maker. I always keep a hand held coffee grinder to grind my own coffee and then prepare coffee myself. The same thing happened to me last month and I ended up using my manual hand grinder and a old sock (yes it was clean) as a filter. As crazy as it sounds it worked a treat and I was able to get my morning caffeine fix before I left the house! Not recommended unless you are highly addicted to your morning coffee fix!